For over 50 years, Smokey Glen Farm has set the standard of excellence for corporate events in the Washington Area. We're proud to offer you the very best in service, facilities, food and fun for your group's special event. 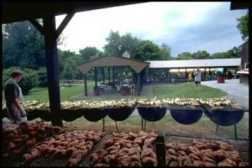 The Smokey Glen Farm experience lets you mix a little business (or none), a lot of play, refreshing country vistas, and our famous barbeque specialties, all in complete privacy for your group.